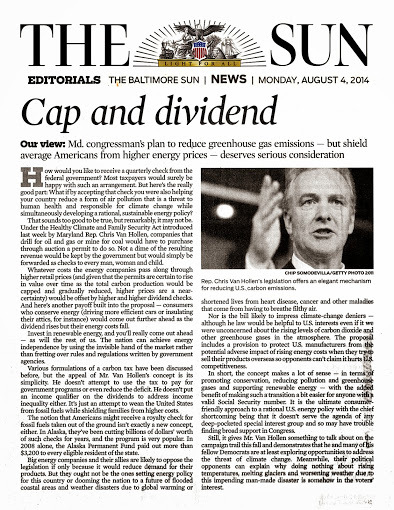 Less than a week after Congressman Chris Van Hollen introduced the Healthy Climate and Family Security Act (H.R. 5721), Maryland’s most influential newspaper, the Baltimore Sun, published a strong editorial endorsing the bill. How would you like to receive a quarterly check from the federal government? Most taxpayers would surely be happy with such an arrangement. But here’s the really good part: What if by accepting that check you were also helping your country reduce a form of air pollution that is a threat to human health and responsible for climate change while simultaneously developing a rational, sustainable energy policy? Big energy companies and their allies are likely to oppose the legislation if only because it would reduce demand for their products. But they ought not be the ones setting energy policy for this country or dooming the nation to a future of flooded coastal areas and weather disasters due to global warming or shortened lives from heart disease, cancer and other maladies that come from having to breathe in filthy air. In our estimation, the common-sense simplicity of the bill is a cornerstone strength. It gets the job done for the climate and for U.S. families. It’s the type of approach that has real potential to garner broad-based popular support. Click here to read the full editorial in the Baltimore Sun, and then sign the petition to add your name in support of the Healthy Climate and Family Security Act of 2014.